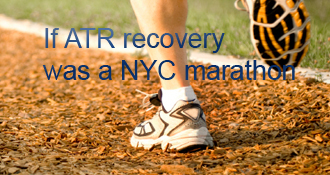 soccergirl has completed the grueling 26.2 ATR miles to full recovery! I had a follow-up appointment with my OS this week, and he said everything looked great and gave me the clear to start weaning off the boot and into 2 shoes. At PT, we practiced walking in 2 shoes and started doing heel lifts and stepping up and down small (very small) steps. It was a bit harrowing but feels good to be able to walk around without the boot on, even if I am still wearing the boot while out of the house. I feel like transitioning to 2 shoes is similar to transitioning to FWB - more a mental issue than anything else and trusting that the tendon is strong. Will definitely be careful over the coming weeks to not overdo it and guard against slips, but am feeling like being able to walk in shoes will go a long way to building my calf muscle back. Wishing everyone a safe and speedy recovery. Just saw this story about DeAngelo Hall (Washington Redskins cornerback). He ruptured his Achilles about 6 weeks ago and had surgery, and just reinjured it when he slipped late at night, and had to have surgery again. Link to story is below. Serves as a reminder to all of us recovering to go slow and be careful. It has been 8 weeks since my surgery, and two weeks since I got my cast off and moved into a walking boot. I am just now finally FWB. It took me about two weeks to get to this point. I was able to move to PWB right away, but getting totally crutch/cane free took longer. Part of my problem was that my bad foot (left leg) is also where my bad knee is. I tore my meniscus several years ago and had surgery, and ever since then my left knee has given me problems from time to time. Activities like biking and swimming help keep my knee feeling good, but after being in a cast for six weeks my left knee did not like having weight suddenly put on it again and rebelled a bit. I’ve been on the stationary bike and doing lots of straight leg raises trying to get the muscles around my knee strengthened and that has helped. So, with my knee feeling better, I have finally been able to fully transition to FWB, though by the end of the day my walk certainly looks a little funny! My next appointment with my OS is in two weeks, and I’m assuming I will be cleared to ditch the boot and start wearing two shoes. Things seem to be progressing well, and as so many folks here have said, getting out of the cast and being able to put weight on the leg and start working on ROM has made a huge difference. My spirits are better and the light at the end of the tunnel is getting brighter and brighter! 1. Even-ups work. Used it on my good foot when my hips were starting to hurt, and cleared the problem right up. 2. Aircast vs. Vacocast - I have both, and have been using the Aircast during the day for walking, and sleeping in the Vacocast at night with the front piece off. For me, the Aircast just felt like it was giving me more support and I didn’t limp as much as I did while walking in the Vacocast. Definitely a personal preference thing as it seems based on comments here that generally folks prefer the Vacocast. 3. PT really helps - I had my first PT appointment the day my cast came off. Have had 7 appointments so far, and my ROM is getting pretty close to my good foot. PT is emphasizing lots of stretching exercises (focusing on the ankle and achilles, but also working on the calf, hamstring, quads and glutes as well) and has been doing lots of massage to break up the scar tissue. Wishing everyone a safe and speedy recovery! 6 Weeks Post Surgery - Cast Finally Off!! So, 6 weeks post-surgery I finally got my cast off! Wound is healing nicely - still a little scabbed at the bottom but looks like the scar won’t be as bad as what I was imagining. My calf muscle appears to be gone (although my PT assures me there is still a little something there!). OS put me in an Aircast (with one wedge) and told me to start weight-bearing as comfortable. Feels awesome to be out of the cast! After reading comments about Aircast vs. Vacocast, I ordered a Vacocast to try. I’m still trying to figure out which one I like more. They both seem to provide me good support and are both pretty comfortable. I’m still transitioning from PWB to FWB, and I think the vacocast is a little easier to walk in (easier to roll from heel to toe in it than in the Aircast). The day after I got my cast off I had my first PT session. PT took measurements of my feet. Bad foot was a little swollen but not too bad. ROM on my bad foot was pretty awful, so PT said we are going to be working on ROM, strengthening and stretching. PT massaged my foot and leg - nothing too hard - and did some gentle stretching and manipulating of my foot. PT said she would do more scar breakup as we progress, but for now is just trying to introduce movement into the area since I have been immobilized for 6 weeks. PT says first goal is to have me ditch the crutches in about a week, though the mental aspect of putting full weight on my leg after being NWB for 6 weeks is a bit harrowing. I think it requires a bit of a leap of faith to go from PWB to FWB! All in all, things seems to be progressing well (touch wood - don’t want to jinx it!). Wishing everyone a safe and speedy recovery! 8/23/14 - I am a 43 year old female. Was playing soccer, got the ball, was about to make a move and felt a sharp pain in my left calf. Went down and immediately turned around to see who had kicked me from behind. Of course, no one was there. I hoped that it was just a strained calf but had a sinking feeling that it was my Achilles. Had my partner do the Thompson test on me when I got home, and my sinking feeling was confirmed. Went to the ER and was formally diagnosed with a ruptured Achilles. Was put in a splint, given crutches and told to call an orthopedic surgeon on Monday (injury happened on a Saturday). Spent a lot of time on the internet trying to figure out how bad the recovery would be, and quickly realized that I am totally screwed. 8/25/14 - Saw my doctor (same one who operated on my torn meniscus in my left knee 10 years ago) and he scheduled me for surgery the next day. His view was that surgery gives you a better prognosis for being able to do the same kinds of sports you did before the injury and recommended this approach vs. a non-surgical approach for me (although the chances of me playing soccer again once I am recovered are slim - think I might stick to biking and swimming after this ordeal). 8/26/14 - Had outpatient surgery. Surgery was at 5:15 p.m. and I was home by 8:00 p.m. Took a couple of percocets over the next couple of days but by the 2nd day the pain was manageable and painkillers were no longer necessary. We rented a hospital bed so I could sleep on the main floor and not worry about having to tackle the stairs every day to go up to the bedroom. Was great being able to keep my leg elevated so easily with the hospital bed and electronic bed adjusters. I also iced my knee a lot in the hope that it would cool the blood that was circulating in my leg. Not sure it really worked, but ice on the splint/cast didn’t seem to cool my leg down at all so icing my knee was the next best thing. I also wiggled my toes a lot to try to keep things moving. I basically stayed in bed as much as possible for the next couple of weeks. Went into work a couple of times (I have an office job) but was largely able to work from home with a laptop and doing conference calls. 9/11/14 - 16 days after my surgery I had my first follow-up appointment with the doctor. My staples were removed (a little painful but not too bad) and I got a cast put on. Doctor said everything looked to be healing fine and to come back in 2 weeks when they would cut the cast off to check the wound, and then likely recast for another 2 weeks. My doctor said that he has used both the accelerated and conservative recovery protocols, and prefers for his patients to say in a cast for 6 weeks post-surgery before moving to a walking boot. Ugh. So, I’m going to be NWB for 6 weeks post surgery, and then will move to PWB once I get my boot. 9/25/16 - It has been 4 weeks since my surgery. Had my second follow-up appointment with the doctor. My cast was cut off so he could check the wound and make sure it is healing okay. Everything looked fine. My leg was put in a new cast, and as they were casting my leg the doctor told me to point my toes up as much as I could to try to bring my foot closer to 90 degrees. My calf muscle is so weak I had a hard time holding my foot steady - it was shaking like crazy as I tried to point my toes up. So, 2 more weeks of this before I get my walking boot. I am still trying to keep my leg elevated and am working from home as much as possible and trying not to overdo it. I have noticed that the swelling is getting much better. Before, if I put my foot down for more than 5-10 minutes, I could feel my toes swell and it felt very uncomfortable. Now, I can put my foot down for up to an hour and it feels fine. I have noticed, however, that on the days when I go into the office, I am totally wiped out by the end of the day and my cast feels tight because my leg is so swollen. So, I will just try to keep it elevated as much as possible for the next 2 weeks and look forward to the next milestone. Long road ahead, but reading other blogs and seeing what everyone else is going through has been a tremendous help in getting through this so far. today I am 4 weeks post surgery and i am already partial weight bearing with one crutch. I started PT last week and it is going fine. I stayed 2 weeks in a splint then directly to the boot with 2 wedges. Yesterday they removed one wedge as my range of motion is good. Im getting very close to Neutral. the doctor said i should have 1 more month in the boot. it really depends on your doctor. Jennifer, most of us experienced sensitivity under-foot, especially under the heel. Very rarely, it can progress to a heel spur (fasciitis) and linger, but it usually fades harmlessly, though sometimes quite slowly. Weeks later, I still found barefoot walking scary, because stepping on even the tiniest piece of nothing felt like walking on a bed of nails! Not abusing it helps, as do: (1) squishy soft gel under-foot (a footbed in the boot, then Crocs or similar in 2 shoes), and (2) gentle massage, like rolling your bare foot over a ball while seated. Some people prefer a frozen water bottle (small plastic) to a ball. If your hips aren’t level — i.e., if you haven’t found a way to build up your “good” foot so it’s as far off the floor as your booted foot — you’ve got to fix that. Walking uneven can damage your hips and knees and spine etc., and can also teach you compensating ways of walking that are surprisingly hard to “lose” later. Are you having heal pain? I have been upgraded to FWB in boot transitioning into shoes. I have discomfort in my heal and bottom of foot. I’m also feeling soreness in my hip flexor from weeks on NWB. Congratulations on moving on to 2 shoes! Every day does get easier/better so just keep that in mind and be mindful of where you step! Good luck to you. Thanks for the replies. Stuart, you are absolutely right. I find just walking around the house to be mentally draining (it may have something to do with wondering whether my two kids or our 140 pound dog will come running by at any minute causing a slip!). I am definitely walking slowly and cautiously! Ctcbusted, yes, I really like my PT and have had a great experience with them so far (12 sessions to date). I am using ProAction Physical Therapy. They are in the Bethesda/Rockville area (so may be inconvenient if not in the area). Yeah!! Your recovery protocol seems to be the closest to mine. So, it is very encouraging to see your progress. BTW - I live in Washington DC as well and would love to know if you recommend your PT (and who it is). You are going to be amazed at how aware you are of your surroundings when you step out of the house and into the world. Its like the old saying watch your step but so much more intense. Some people actually get quite tired mentally until they get used to it. Good stuff. If you used my trick for walking downstairs in the boot, you can keep using it in 2 shoes, until you build up more strength and ROM. Walking in shoes again is wonderful. Each day gets easier and faster- thank goodness for that as I started at a nervously slow snail pace! I live in DC and am a Redskins fan. I have been following DeAngelo Hall since our injuries we around the same time. This is indeed a warning to all of us to be very careful on crutches/rollers/Iwalks to make sure we avoid falls. Op or non op you still have to do the right thing. He probably should not have been making pizza. Or should that be probably he should have been wearing protection. Still doesn’t sound right. I doubt the big league stars are ever going to believe in anything but surgery to fix every injury. It is conditioned into them and it is a money thing for which they probably have no control over. To suggest otherwise would lablel you a witch doctor. How can the body possibly heal itself?? Needless to say the imortals and invincibles are suffering the same as us and deserve the best treatment available plus our simpathy. It does say regardless of the manner of treatment, re-rupture can occur. Yes, don’t be careless or stupid for they are the most common causes or re-rupture apart from the odd accidental slip or trip. That Wallace study is summarized and linked at Achillesblog.com/Cecilia/Protocols . One of the most amazing things about the huge new Wallace study from Belfast is the <3% non-op rerupture rate he got from his ~1000 ATRs. But the MOST amazing thing is that he successfully treated ALL of those reruptures non-op!! Of course, it will be even more amazing if any of us lives long enough for the world’s (or the U.S.’s) professional athletes to follow that evidence! Your recovery sounds similar to mine. I have a cast and NWB for 6 weeks after the surgery. I am glad to see that you are making out well with this sort of a schedule. I have 3 more weeks in the cast. error seems to come and go (mysteriously, to me), and may have caused this problem. When it’s time to wean off the boot (maybe now, or soon), a hinged boot seems a very helpful transition tool. I’ve no experience with the Vaco, but I’ve used a hinged boot in both of my ATR rehabs, and an AirCast in one of them. If the Vaco without the front is similar to the AC without the front, you would be very vulnerable if you got up and started walking. Congratulations on having your cast removed! For me, that was when things started to look up! The cast was just so restrictive and sometimes became very uncomfortable when my foot started to swell! Very happy for you that you are done with the cast! It is a bit of a disadvantage to be locked up for 6 weeks but things will start moving. Active ROM exercises can start after 3 weeks if in the boot from the beginning. You will catch up pretty quick and the deep massage should get things free. The progession to FWB will also be easier than you think and a little less daunting than when you will be ready to lose the boot. Each transition has the associated fear factor but you get over it quick enough once you start. ROM will be a thing you will have to deal with for a while. There may be times where you have some huge gains and other times when you are getting nowhere. Just be careful not to try and get it all back too soon. It will come. Getting into a boot is a wonderful thing, so much more comfortable and means the PT can get started. The ROM will improve very quickly, I felt like my brain and foot had to remember how to connect again. I am also in a Vacocast and have found taking the front piece off at night makes it way more comfy. Good luck moving to FWB and being crutch free! Thanks coast2coast. You’re right - patience, perseverance, persistence and passion are all necessary at this point! I am thinking positively and believe that when I am fully recovered I will be able to play soccer again from a physical standpoint. It’s more of a mental block - I wonder whether I’ll ever engage in an activity that involves explosive movement without thinking in the back of my mind that I could rupture the other Achilles. Did you have this concern when you started playing football and softball again? Sorry about your injury, soccergirl, but welcome to the ATR club and the AchillesBlog community. Your comment about “playing soccer again once I am recovered are slim - think I might stick to biking and swimming after this ordeal” will totally depend on your own recovery and rehab, of course, but many of us on this site — with the right OS, the right PT, a bit of luck and a LOT of patience — are back on the field, court, or course doing what we love. - back to full activity based on my own symptoms at 5 months (went skiing to celebrate). - since then, have run three 5k-5mi obstacle course races, 40 mi bike rides, two 5ks, and am playing softball and football again. Patience, perseverance, persistence, and passion: you can do it!!! Fuzzygreenball (love your username! ), thanks for the comment. It’s good to hear that someone who injured their achilles at around the same time as me is walking around with the boot with no pain. I am still in a cast, but move into a boot in 5 days (not that I’m counting). I’m hoping that I can move to PWB and then to FWB relatively quickly once in the boot, though am determined not to push it because a re-rupture at this point would be devastating. I heard the same thing regarding PT. My doctor prescribed 3 sessions of PT a week for 6-8 weeks, but when I went to book my PT appointments (first one is the day after I get into the boot), they recommended that I should start with 2 sessions per week and then build from there as I develop more strength. I completely ruptured my Achilles exactly 1 week before you did, on 8/16/2014, during a tennis match. I’m a little past week 5 (post surgery) and feel pretty darn good. My ortho’s script called for the PT to follow protocol, which puts me at “weight-bearing as tolerated”. Just yesterday, I started walking around with the boot on (2 wedges,) and have no pain at all. There seems to be so many great perspectives on the rehab/recovery process. And some may vary. My sister-in-law is a PT. After assessing me, she recommended that I take 3 PT sessions per week for 8 weeks…then trim it down to 2 PT sessions for the remaining 4 weeks. Yet, when I went to my actual PT, he recommended 2, and then build up as the Achilles is able to tolerate more rigorous exercises. - Personally, and in part, I’m just trying to listen to what my body is telling me. I’m right there with you, in terms of timing. Keep strong, and know you’ll come out of it better than where you were before! Welcome to the club- I am sorry you have joined up but this site is a great source of information and support. Norm and Stuart have both given you great advice and I think the good news is that your slow protocol will not impact you long term. You sure do have a long time NWB and that will be tough once you move to a boot and then 2 shoes. If you can’t, or don’t feel it appropriate, to challenge your recovery protocol then think ahead and set up PT now so that you have an appointment as soon as you leg is cast free! All the best. AchillesBlog/Cecilia/protocols summarizes 3 studies with World Class results. One of them is ~100% non-op, the other two split (1 randomized split). All three of them skipped about a month of the torture you’re going through, and they probably all got results at least as good as your OS (often with no sensitive wound and no scar). Finally, my blog has a link to a great BMJ article on alternatives to Evidence-Based Medicine. Your OS may prefer Eminence-Based Medicine! Your OS’s approach to scientific evidence is unimpressive. Your willingness to follow his lead is impressive, but arguably ill-advised. All IMO, of course! soccergirl’s AchillesBlog is proudly powered by WordPress and WPDesigner..